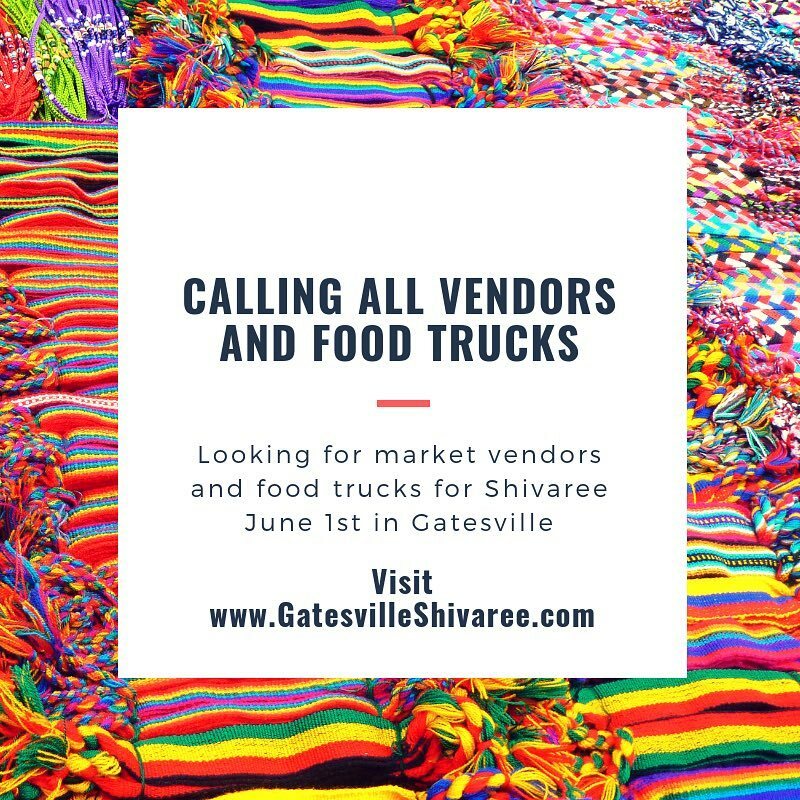 Market & Food Vendors - Gatesville Shivaree! Calling All Vendors & Food Trucks! Vendor parking rules: once booth is set up Vendor must move vehicle(s) to the designated parking area and keep parking pass visible on the dash of vehicle(s). No Power will be available for non-food venders. Food Venders may pay an additional $20 for Power. Food Space, 12’x20’, $75, $20 if power is needed. Set up is Saturday morning only beginning at 5:00 a.m. Festival begins at 9:00 a.m. and will remain open until 10:00 p.m. Vendors may not teardown or stop selling goods/services during Market time. We will offer two tear down times 1pm and 5 pm. Vehicles will ONLY be allowed in Market for 1 pm tear down. You will have 1 hour to tear down your space. After 1 hour, vehicles MUST be removed from market. Food Venders will also be give option of two tear down times, 1pm and 10 pm. We will allow you to close windows from 1pm-5pm, but must be re-open at 5pm for evening festivities. There will be no vehicles in market space during market hours, for ANY REASON. Once applications are approved, payments are non-refundable. Applications may be turned into the Gatesville Chamber of Commerce office in The Cotton Belt Depot Visitors Center or mailed to: Gatesville Chamber of Commerce, 2307 S. Hwy 36, Gatesville TX 76528.